In the last three articles we have looked at the essential equipment needed to get started with routing technology and its application to fine furniture-making. These are: the router itself, cutters; safety issues and the basic techniques which form the foundations of most of the work we are likely to do. One of the great strengths of the modern router is its portability. We can freely move it around the bench and workshop, applying it to the various components we want to machine, and even take it away from the workshop and use it on site when the occasion arises. There are times when it is better, instead of taking the router to the workpiece, to take the workpiece to the router. In other words, use the router as a fixed piece of machinery, rather than a hand-held power tool. We need to be able to do this for two main reasons - one is that when the component is small, or of such a shape that it is impractical or unsafe to try and use the router held in the hand, for example, when working a moulding or groove on a short, narrow piece of timber. The other is that the fixed inversion of the router allows us to carry out many more tasks and gives us the full benefit of its capabilities. Tables will accept both 1/2 inch and 1/4 inch collet routers, but it should be borne in mind that only the 1/2 inch machines will accept the full range of cutters available and allow us to use the router table to its full advantage. In fact, for many of us, a powerful 1/2 inch collet router and suitable table does all we would require of a spindle moulder, such is the versatility of this combination. In essence, the router table is simply a firm, flat, surface to which the router is attached on the underside, with a hole bored for the cutter to pass through. It also has an adjustable fence and some means of raising it off the floor to a convenient working height. Desirable extra features include some means of dust extraction and safety guards. There are a number of commercially available router tables, many of them advertised in this magazine, but it is quite straightforward to build your own. The dilemma, at least for the professional maker, is the same as the one we face over acquiring a bench. Should we spend valuable time building our own, when we could be making a piece of furniture and earning money, or should we just go out and buy one? The advantage of buying a ready-made router table is that no making time is lost. But by building our own, we can customise it exactly to our own requirements. For example, some advanced craftsmen build their own router tables specifically designed for certain processes, such as the thicknessing of stringing for inlay work. I use two tables. The first is a Trend 'Craftsman' router table, which has the advantages of good guards and provision for dust extraction, and sits on a firm, stable base. The second is a very basic home-made table, knocked up in a couple of hours about 15 years ago. Ideally, router tables should be equipped with an adjustable sliding fence, (as the proprietory ones are), which runs in a slot, just like those on dimension saws. This enables a workpiece to be accurately held and machined independently of the longitudinal fence, and at angles other than 90 degree. Some of the commercial items are a little flimsy though and prone to inaccuracy, especially those made partly of plastic, though here again we can improve on things and make our own. The router table is used in four main ways, which we will look at in turn with examples. Firstly, I use it with the workpiece held against the fence, as in ripping a length of timber. Grooves, rebates and mouldings can be produced this way, on components ranging from a short narrow door rail for instance to a large panel. The maximum size which can be safely accommodated will depend on the dimensions of the router table. Since the workpiece is fully supported, the need for run-in and off boards when working edge mouldings is eliminated. Similarly, a short, narrow, piece can be successfully grooved, without having to try and balance the router on the edge or devise jigs to keep everything true. Stopped grooves are more tricky since the cutter is hidden from view and these are best done with the router in the upright position. By a combination of raising the cutter using the router's plunge facility and moving the fence, more elaborate mouldings can be produced with just one cutter. 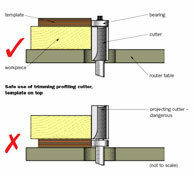 The second technique is to use a pin- or bearing-guided cutter to produce a moulding or rebate. This is excellent when working with curved components and relies on the cutter's own guide bush or pin rather than the table fence. The photograph shows a bull-nosed moulding being worked with a roundover cutter. To complete the shape, the workpiece is inverted and fed through a second time. It will be obvious that this operation on such a narrow piece would be impossible to do with the router held by hand. 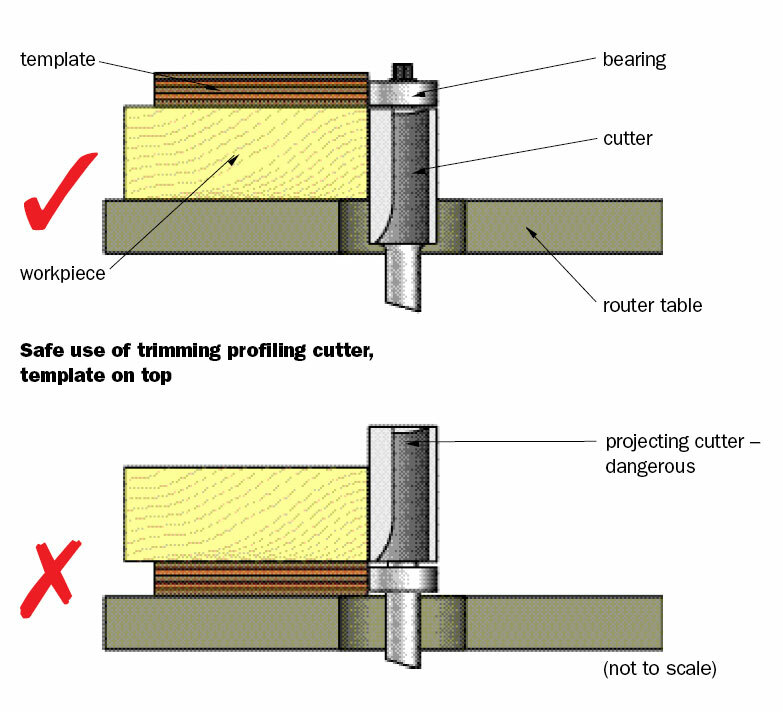 Thirdly, by using a trimming profiling cutter (a straight cutter with a self-guiding bearing at one end), such as the one available from Trend (ref. 46/22), components can be cut to shape by following a template. For safety, I prefer those cutters which have the bearing at the outer end rather than at the shank end. This way, the template is always on top of the workpiece and no more of the cutter than is necessary to do the job is projecting above the table surface. For the furniture-maker, an obvious application is the shaping of chair legs. In the bad old days the hard-pressed craftsman would have to laboriously cut out each leg with a bow saw then shape to the final profile with spokeshaves and scrapers (I've done it). Now all we have to do is make an accurate template and let the bandsaw and router do the hard work. The best material from which to make such a template, in my experience, is 9mm. ply, rather than MDF, since it is stiffer and has less of a tendency to flex against the pressure of the cutter bearing. The template should be 25mm (1in) or so longer at each end than the finished leg, to enable the template to be screwed to the timber blank, which must also be longer than the final size. It is also a good idea to screw the template to the leg part-way along, to prevent any possibility of flexing, which would render the machined leg undersize. But make sure that this corresponds to the position of a future joint, such as where the back seat-rail will go, not where it will later be visible! The blanks should be carefully cut out on the bandsaw to within not more than 3mm (1/8in) of the finished profile - the less material the cutter has to remove the better. With a sharp cutter and steady feed rate, the resulting legs will need the minimum of cleaning up with a scraper or abrasive paper to remove any machining marks. Finally, by using the sliding fence, narrow components can be safely machined across their widths. For example, this method would be used to produce a scribed joint of, say, a kitchen cabinet door, using the appropriate cutter, or to machine a tenon for a door of more traditional construction. I don't use scribed joints and prefer to cut tenons by other means, but find the sliding fence especially useful when working mouldings across the ends of short, narrow components. The photograph shows just such a situation where I recently needed to machine the ends of eight small components of a table I was making. "Stopped grooves are more tricky since the cutter is hidden from view"
The construction is simple but effective, consisting of a panel of blockboard with a 19mm hole in the centre, a hinged leg at one side and a block of wood on the other. The router base is attached to the underside with two tapered turn buttons which allow quick removal and hold the machine very firmly in place. The whole table is secured to the bench by gripping the side block in the vice and supporting the nearside on the floor with the hinged leg. I can't claim any credit for the idea: my table is a bastardised version of one I saw in use in Lucinda Leech's workshop. A drawback of mine is that the thickness of the blockboard limits the distance a cutter is able to project above the surface. A much better way to make it, as no doubt Lucinda's is, would be to recess the table surface to receive an insert plate available from the manufacturer of your own particular router. For a fence, I simply G-cramp an accurately planed batten onto the table in the desired position. Crude though it is, this table has done a lot of useful work and is still employed if the Trend table is set up to do other work. I suppose the point I'm trying to make is that if you are just setting up a workshop and funds are short, the benefits of table routing need not be denied you!